The flexible frame of the VOOZ snow googles maintain their shape and can be twisted without breaking (lenses removed). They afford a wide field of view and increased air flow. They come with a fully adjustable strap with a quick clip buckle and are helmet compatible. The lenses on the VOOZ snow goggles are a German made double-molded cylindrical shape that is the perfect curvature for the human eye. These performance lenses minimize distortion and improve clarity. They feature 100% UV protection and a permanent anti-fog coating. 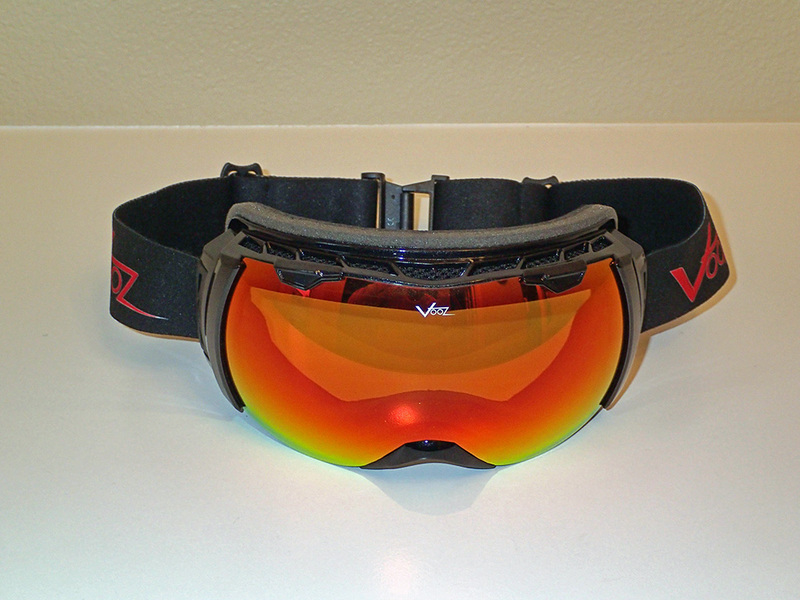 VOOZ snow goggles are available from Powder Keg LLC. I am an eyeglass wearer, so finding comfortable goggles can be a challenge. Chris over at Powder Keg LLC was very helpful and convinced me to try a pair of VOOZ goggles. At first inspection, the VOOZ snow goggles appear to be high quality. And to my pleasant surprise, they have molded channels in the foam on both sides of the goggles for eyeglass arms. This makes the VOOZ snow goggles very comfortable to wear over glasses (which is often not the case with other goggles). There is plenty of room in the goggles so my eyeglasses do not touch the goggle lens at any point. And the field of view is great. I can barely see the edge of the goggles when looking to the far sides. The lenses are easy to change. All that is required is first pulling up and back on the two tabs at the top of the lens. Then the lens can be "peeled" out of the frame. Installation of a new lens is the reverse and just as easy. When talking to Chris at Powder Keg LLC, I learned the frames are made in China (like most things), but the lenses are quality German made. The same lenses are used by the military in some countries. The frames look great, although I did notice some small gaps between the frame and lens in a couple spots. I don't think it will effect the performance, but I'll have to see after I get a chance to use them on a snowmobile ride. I am also not a fan of the quick clip buckle on the VOOZ snow goggles. I find them hard to open and close. But I am hopeful they will become easier to use after some actual use in the snow. We finally received a good dumping of snow around Mt Hood, so I was able to give the VOOZ snow goggles a good field test. It was snowing lightly most of the day with the temperature around 30°F. Normally I wear a pair of Smith goggles with prescription inserts, so I don't have to shove my glasses in my helmet. With the VOOZ goggles I have to squeeze my eyeglasses into my helmet first, which is kind of a pain. 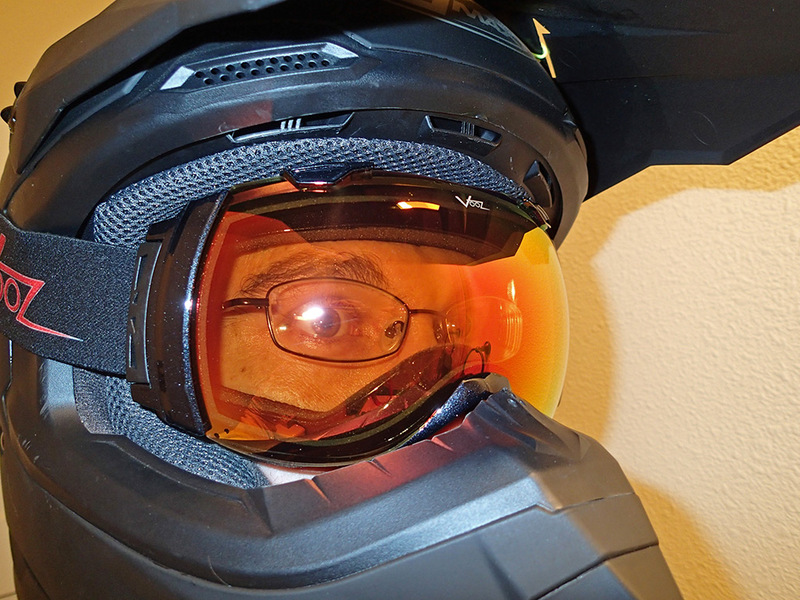 However, with that being said, the VOOZ goggles are the most comfortable snow goggles I have ever worn over glasses. They worked just as well as my Smith goggles that have a fan in them to reduce fogging. The VOOZ goggles would fog a little when I first put them on, but would clear up after a few feet of riding. This is the same behavior my Smith goggles exhibit. With my particular helmet, the VOOZ goggles were a little difficult to remove. They tended to get stuck and would need to be pried out of the face area of my helmet. I also noticed they did not seal tight against my face because of to my helmet. This wasn't a problem on this trip, and actually probably aided in clearing fog quicker after I started moving. I still found the quick clip buckle hard to use. It didn't loosen any after a day of use. I used the amber colored lens and liked they way it made everything look. It was a flat light day and the amber lens did a good job of keeping everything clear. 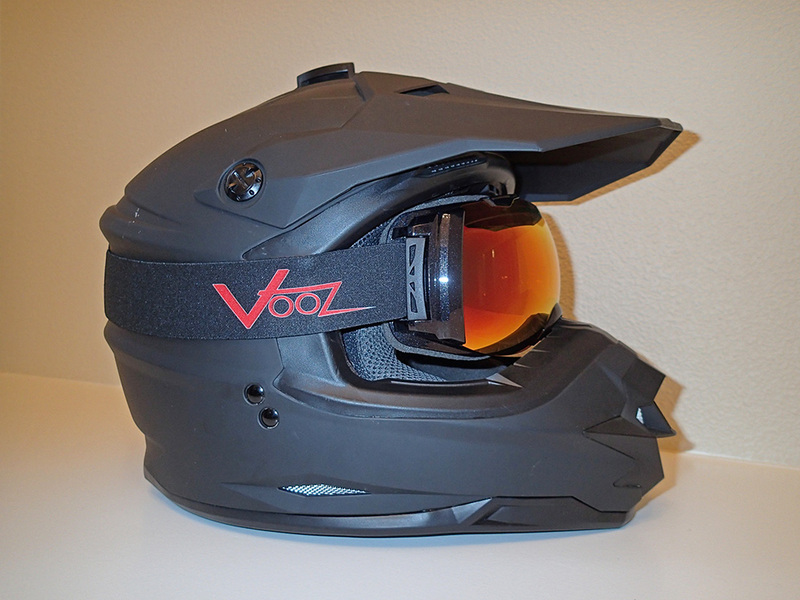 I think the VOOZ goggles would work fantastic with ski/snowboard style helmets, especially for eye glass wearers. If I didn't already have Smith goggles with prescription inserts, VOOZ snow goggles would be at the top of my list. 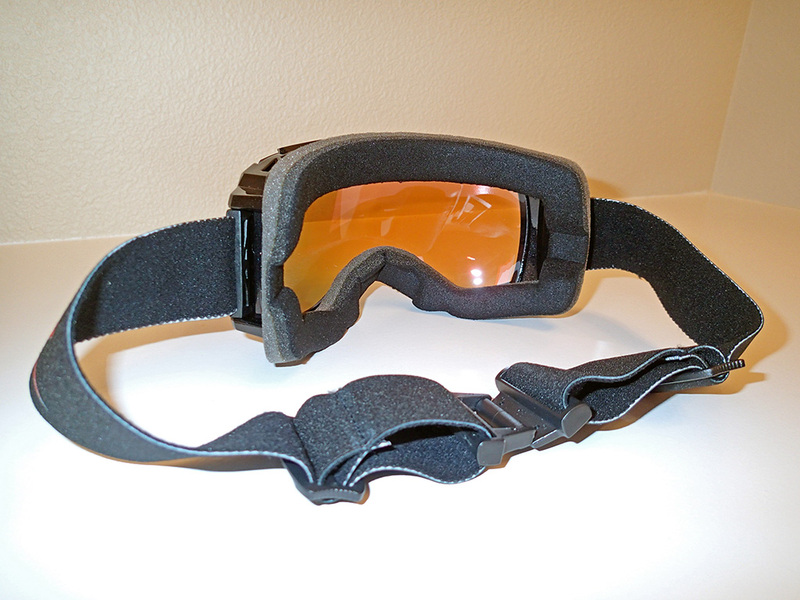 See Frog Lake snowmobile adventure where the VOOZ snow goggles were used. 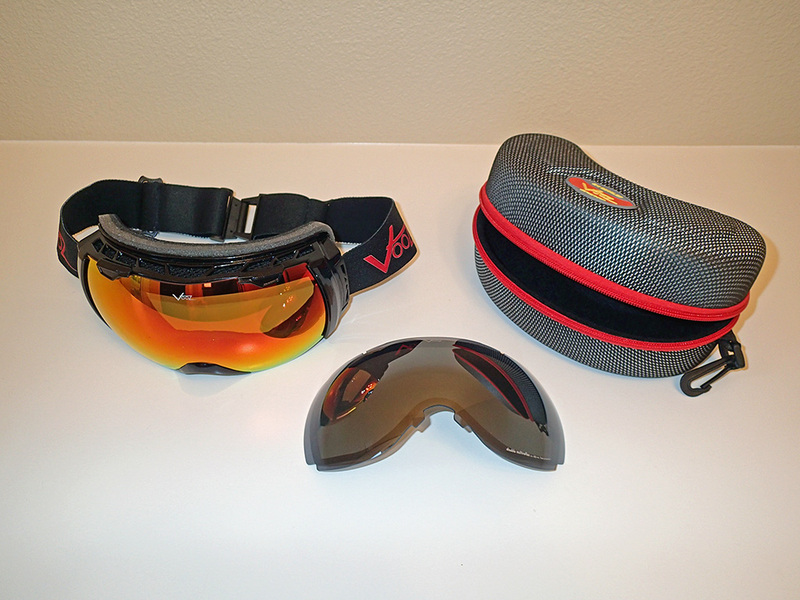 Special thanks to Powder Keg LLC for providing the VOOZ snow goggles for review.